ESA’s Herschel space observatory has discovered that titanic stellar explosions can be excellent dust factories. In space, the dust mixes with gas to become the raw material for new stars, planets and, ultimately, life. This discovery may solve a mystery of the early Universe. The discovery was made while Herschel was charting emission from cold dust in the Large Magellanic Cloud, a small galaxy near to the Milky Way. 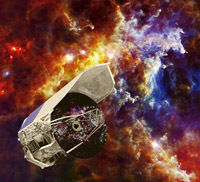 It is the perfect observatory for the job because cold dust radiates far-infrared light, the wavelengths Herschel is designed to detect. Herschel saw a spot of light at the location of supernova 1987A, an exploding star first seen from Earth in February 1987, and the closest known supernova in the past 400 years. Since then, astronomers have been studying the remains of the explosion as its blast wave expands into its surroundings. Herschel’s images are the first clear-cut far-infrared observations of SN1987A. They reveal cold dust grains at about –250ºC, emitting more than 200 times the Sun’s energy. “The supernova remnant was much brighter at infrared wavelengths than we were expecting,” says Mikako Matsuura, University College London, who is the lead author on the paper detailing these results. The remnant’s brightness was used to estimate the amount of dust. Surprisingly, there turned out to be about a thousand times more dust than astronomers had thought a supernova was capable of producing – enough to make 200 000 planets the size of Earth. The origin of dust in the Universe is of great interest. Its heavy atoms like carbon, silicon, oxygen and iron were not produced in the Big Bang and must have formed later. Although they are only a minor part of the Universe and our Solar System, they are the main constituents of rocky planets like Earth and thus of life itself: many of the atoms we are made of were once part of the dust in the Universe. However, it is not fully understood where this dust comes from, especially in the distant and thus young Universe, but now we have an indication. The many old red giant stars in today’s Universe are thought to be the major dust producers, with the grains condensing like soot in a chimney as warm gases flow away from the star. However, there were no such stars in the early Universe – yet we know there was already dust.